Spaghetti alla Bolognese, Spaghetti Bolognese, or Spaghetti Bolognaise in a form popular outside of Italy, consists of a meat sauce served on a bed of spaghetti with a good sprinkling of grated Parmigiano cheese. Although Spaghetti alla Bolognese is very popular outside of Italy, it never existed in Bologna, where ragù is served always with the local egg pastas tagliatelle or lasagne. Spaghetti is a durum wheat pasta from Naples, and the Naples Ragù of a meat flavoured thick tomato sauce clings much better to slippery spaghetti than Bologna's ground beef ragù. 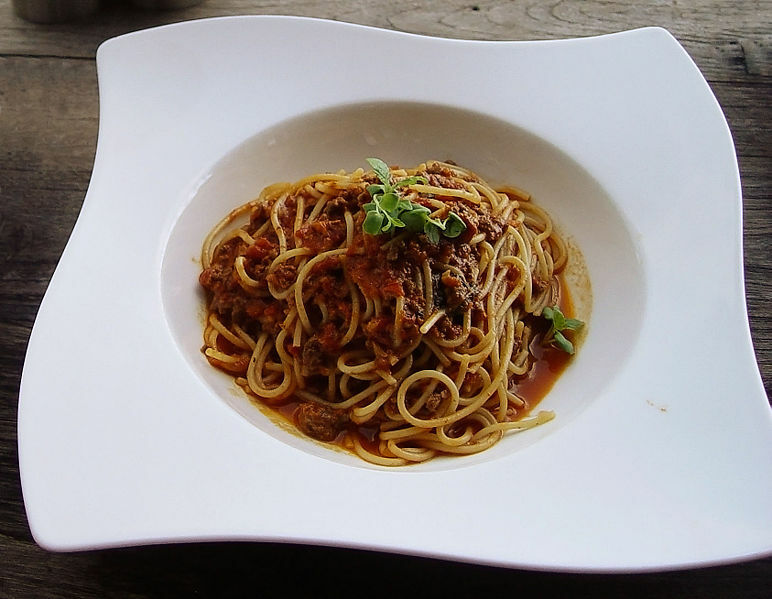 Spaghetti Bolognese is popular in the United Kingdom (where it is colloquially abbreviated to spag bol). In the United States also the term 'bolognese' is applied to a tomato-and-ground-beef sauce that bears little resemblance to ragù served in Bologna.